But Josh Williams vows to continue fighting for social justice during his eight-year term. Ferguson activist Josh Williams, 20, is incarcerated in the Eastern Reception, Diagnostic and Correctional Center in Bonne Terre, Missouri, where convicted killers are executed. BONNE TERRE, Mo. — Josh Williams was one of the youngest Ferguson activists protesting the police shooting death of unarmed black teenager Michael Brown in 2014. He was arrested during the ensuing unrest over social justice issues that engulfed the Missouri city. Now, he’s incarcerated in a prison where convicted killers are executed. “Inmate, where is your name badge?” hollers a guard at Williams, as he enters the prison’s visitor center with a smile on his face. Instead of the neon-green sunglasses and American flag bandana he wore as he protested in and around Ferguson during the protests, he’s wearing a gray scrub suit with white tennis shoes. The 6-foot Williams towers over the guards and other prisoners in the room, as an officer gives him another name tag. 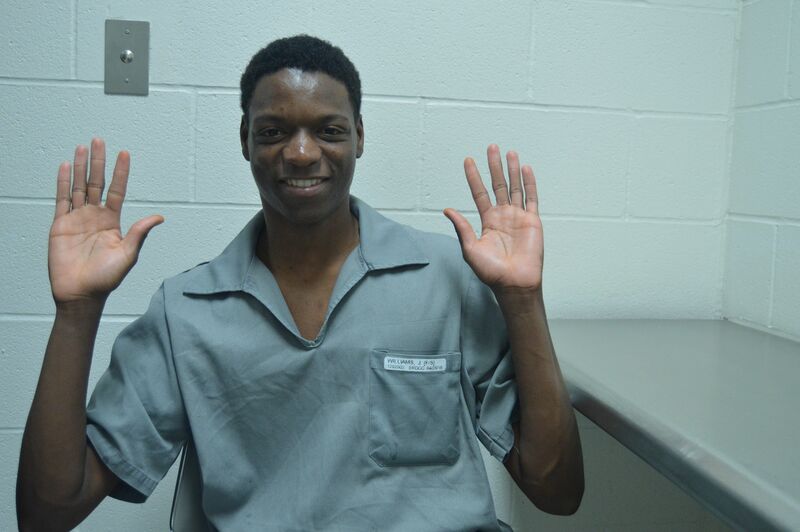 The 20-year-old who had never been incarcerated before has now been behind bars for five months. Many activists have moved on to larger platforms to stand against police brutality, and though Williams has more than 90 months left to serve, his passion for civil rights remains strong. His sense of humor and willingness to confront authorities made him stand out during the protests. He yelled at officials at public meetings, and stood face-to-face with heavily armed police during the unrest. MSNBC and The New York Timeswrote about him. He marched alongside the philosopher Cornel West and spoke at a rally in Washington, D.C., that the Rev. Al Sharpton organized. Then, just before Christmas 2014 and a few months after Brown’s death, a copfatally shot a teenager who the officer said pulled a gun on him outside of a gas station in Berkeley, a town near Ferguson. Protests erupted at the scene and there were clashes with police officers. People looted a nearby QuikTrip convenience store and video footage showed Williams attempting to light a fire near the building’s entrance. St. Louis County police arrested him on Dec. 26, 2014. His bond amount was set at $30,000. Yet Williams was sentenced to eight years in prison. That’s longer than other Missourians who committed similar crimes, including a 28-year-old man who started a fire that caused $1 million damage at the University of Missouri and Stephens College, who was sentenced to six and a half years. Williams and his supporters believe that Judge John D. Warner Jr. sided with a prosecution request to “make an example” of him. Activists sang “Justice for Josh Williams, justice for all of us” while the judge broke to review information in another room. “The protesters came to support me and he didn’t like that, so he gave me eight years,” Williams told HuffPost. 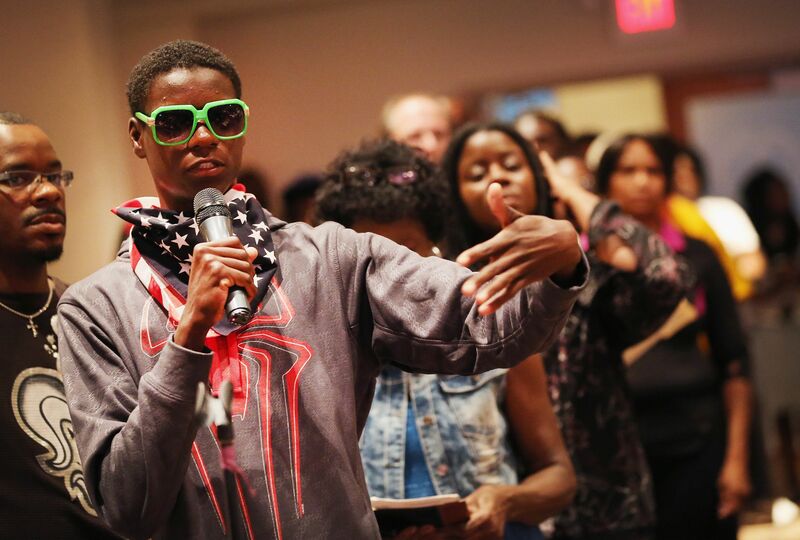 Williams became well known in and around Ferguson during the protests for wearing neon-green sunglasses and an American flag bandana, as he gave passionate speeches during rallies. Williams is now incarcerated in the Eastern Reception, Diagnostic and Correctional Center, about an hour’s drive south of St. Louis is Bonne Terre, Missouri, set amid heavily wooded hills. The facility holds around 2,000 inmates and is where the state carries out executions. Missouri officials executed six people there last year — more than every other state save Texas — and 10 people in 2014. That same year, authorities charged three former officers with inmate abuse. He said he regrets what he did and before the Ferguson protests, he had a normal life. Williams grew up in St. Louis County, a region now notorious for using police departments to ticket mostly black residents in order to gain city revenues. Going to church every Sunday made him want to be a youth minister. During the Ferguson unrest, Williams spent nights with other protesters to avoid sleeping in parking lots. Williams said he ran away from home in order to be more embedded in the protests. Those who knew him best during that time say his relationship with his mother was strained. However, Williams said he now talks to her every day. Tony Rice, a fellow Ferguson protester, said he decided to welcome Williams into his home after seeing other demonstrators give the young man blankets and pillows for yet another night sleeping on the streets. Williams had been staying with Rice for a few months before he was taken into police custody. “He would stay up all night on my iPad listening to gospel music and reading the Bible,” Rice told HuffPost. Before heading back to his cell, Williams’ asked if HuffPost could rely the message to back to Rice, that he needs his address in order to schedule a visit. Williams said he wants his protest family to continue to speak-out against police killings. “Although I’m in here, I’m still fighting in here. Keep strong with it and I’ll be out soon,” Williams said. But first he must complete 85 percent of his eight-year sentence — more than six-and-a-half years. If he serves his full sentence, Williams would be released in 2023.